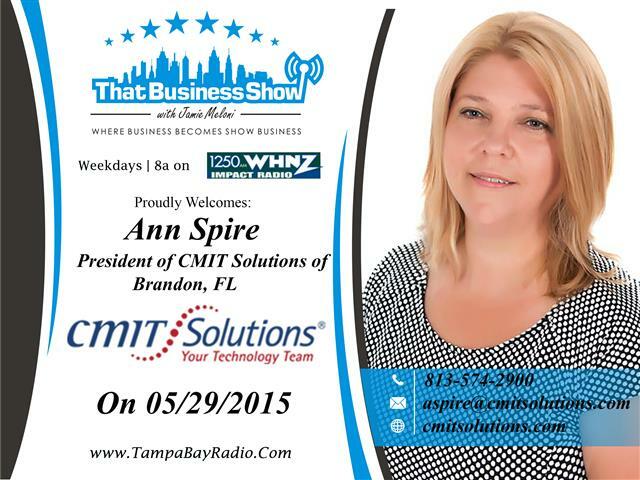 Opening up the show today was Ann Spire, President/Founder of CMIT Solutions of Brandon. CMIT is an On Demand IT Solutions company that assists business owners with a wide array of IT services from cloud computing and disaster recovery to network administration and MAC support as well as much more. Prior to opening her CMIT Solutions office in Brandon, Spire held key roles at several large corporations, where she accumulated more than 26 years of experience in the fields of accounting, business development and information technology. Ann shared with us tips business owners need to be aware of starting with the Microsoft Tech Support Scam which targets small businesses and their unsuspecting employees by advising them of a problem within their network and gaining access to it through the employee’s misplaced trust. Once inside, the hacker can hijack information or hold hostage the information and the cost to the company can be catastrophic. On top of that, the average business does not learn of the breach for months after the occurrence which adds to the damage. Ann and I also discussed many other common computer threats including the crypto-locker viruses and common email scams. CMIT Solutions is the leading provider of IT services for SMBs, particularly those that employ between five and 99 employees. CMIT Solutions operates on a managed services model that offers proactive outsourced IT services and management services at affordable, consistent monthly rates. Ann invites all people interested in learning more to contact her for a free assessment – she can be reached at 813-574-2900 or email at aspire@cmitsolutions.com and learn more at http://www.cmitsolutions.com! 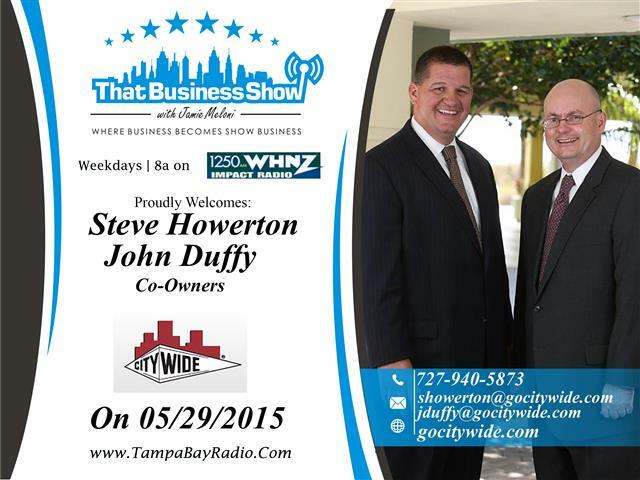 On the 2nd half of the show, I was joined in studio by Steve Howerton and John Duffy, Co-Owners of City Wide Maintenance, a building management solutions company that does everything inside your commercial building except roofs and elevators they joke about. Steve and John spent years working inside corporate America and decided to join the entrepreneurial movement a few years back after stumbling across the City Wide business model online. More than a year later Steve Howerton and partner John Duffy pulled together most of their life savings and did it by opening the 25th City Wide location. Since then, the company has grown to near 2.5 million in annual revenue with a loyal customer base servicing more than 150 customers in the Tampa, St. Petersburg and Sarasota area. Steve and John love City Wide’s 20+ Services Approach and the fact that 3 parties win with the City Wide model. The customer no longer has to manage their outsourced vendors, the crew gets training and a clear scope of work, and City Wide gets a customer for life. Contact them today if your building is in need of management solutions – phone is 727-940-5873 or email them at showerton@gocitywide.com / jduffy@gocitywide.com and learn more at http://www.gocitywide.com! #ThatBusinessShow treks on with another informative and inspirational broadcast this morning at 8am on 1250WHNZ. Each and every weekday morning, I bring attention to the people leading and making a difference in our community by highlighting what is right with Tampa Bay. 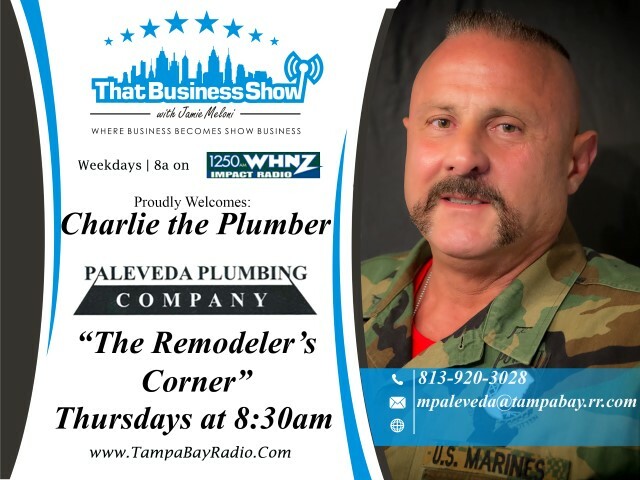 If you are a business owner or someone with a great story to share and interested in an appearance on the show, please email me directly at Jamie@tampabayradio.com! 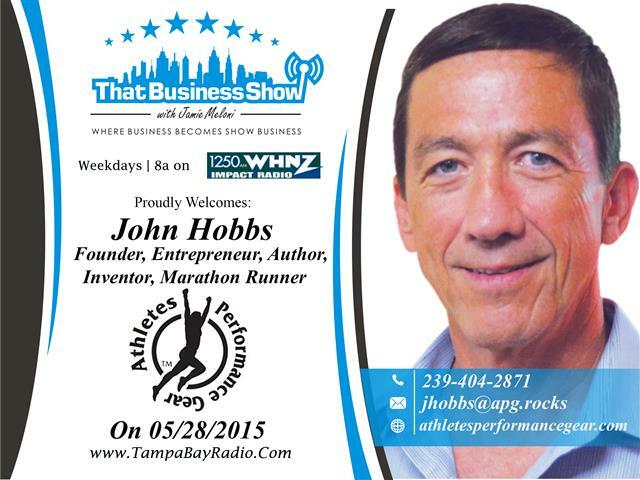 John Hobbs joined me on the show today. John is a published author, marathon runner and inventory of an extremely beneficial multi-functional hydration system for runners and walkers and Founder of Athletes Performance Gear, Inc. This creative and beneficial device was launched after John continually experienced hitting the wall during his runs at 7 miles and realizing he needed proper hydration throughout the run to make the long distance runs he was looking for. He built the prototype of iHydro Run and found that he was able to carry his runs much further and eventually began running marathons. John and I discuss this and he touches on the steps he took to get the idea out of his head and into the marketplace. Through extensive research and ingenuity he has been able to bring this product to the marketplace and has raised a good bit of money from investors for its expansion. John is about to launch thousands of TV commercials to promote the product and is still looking for more investors. The company is setup properly to allow for accredited investors to get involved and he invites you to contact him for more information at 239-404-2871 or email at jhobbs@apg.rock and learn more at http://www.athletesperformancegear.com! 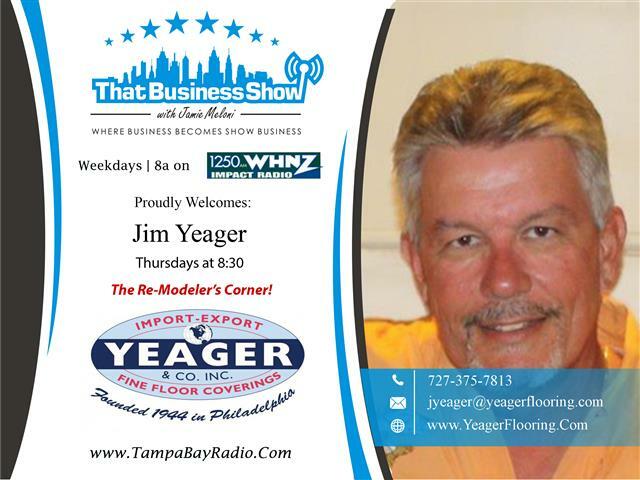 #AmericanPlumber joined me in studio today as well as part of #TheRemodelersCorner brought to us by Jim Yeager of Yeager and Company, a third generation flooring and remodeling company based in Odessa, Florida. Charlie and I touched on gun rights and he adds some flare and color commentary to the discussion with John. Be sure to visit http://www.yeagerflooring.com and mention the radio show for a great deal on your next flooring or remodeling job! Today marked another #WorkingWomenWednesdays feature brought to us by the Working Women of Tampa Bay Networking Group and Founder/CEO Jessica Rivelli. Jessica checked in at the top of the hour with an announcement on the expansion of the networking group into Dallas. Currently at over 700 members in the Bay Area and Orlando, this is a group to get involved with in the area. Jessica and I also touched on the shows popularity amongst female audiences and she points out that many women want a positive message in the morning, something #ThatBusinessShow brings to the airwaves each and every weekday morning at 8am on 1250 WHNZ! Learn more at http://www.workingwomenoftampabay.com! 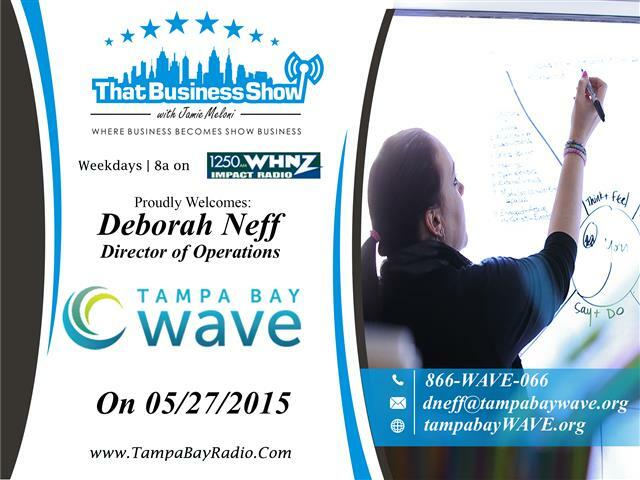 Deborah Neff, Director of Operations with Tampa Bay Wave, joined me in studio as the guest for the rest of the show. Tampa Bay Wave is a business accelerator that assists entrepreneurs in the tech industry with growth and support in their business endeavors. Through a National grant, Tampa Bay Wave has been able to grow substantially over the past 6 years and assist many budding entrepreneurs through this program. Deborah shares with me some of the success stories of people in the area that have benefited from Tampa Bay Wave including a local skateboarder who has designed a skateboard that runs off of an app on your smartphone and known as a Marbel board. I was very curious about this invention and look forward to an introduction to the founder in the near future. Deborah also touches on her role and involvement with Startup Week that goes on in Tampa at the start of the year and about Tampa Bay Wave’s upcoming move highlighting their growth and expansion. If you’re a tech company in need of guidance in your business, reach out to Deborah Neff today. She can be reached at 866-Wave066 or email at dneff@tampabaywave.org and learn more at http://www.tampabaywave.org!